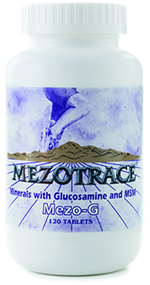 This product has glucosamine and vitamin D added (Minerals, Glucosamine, Vitamin D and MSM) to our flagship mineral compound. The Mayo Clinic notes that available evidence from randomized controlled trials supports the use of glucosamine sulfate in the treatment of osteoarthritis. Vitamin D is helpful to help absorb calcium and protect the bones, and MSM is know to help alleviate the pain associated with stiff joints and inflammation. 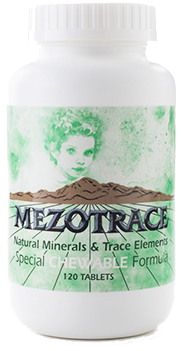 Ingredients: MEZOTRACE Natural Mineral Complex, Glucosamine HCI, MSM, Cellulose, Vegetable Stearate, Silicon Dioxide, Magnesium Stearate, Cholecalciferol, and Chlorophyll.